It looks like EU will apply Vienna Initiative on Greek case, and EURUSD has been stabilized for now. If the market took Greek issue as postponed for a while, then the focus may be the interest rate hike on Euro in July, which is EURUSD positive. I won the last EURUSD short trade by exiting early. It was a good judgement. I saw a completed impulse wave shape from .B to .C in the chart below. Back then, I thought this was rather 2 to 3 (see the previous post). With this subtle indication and a general thought that it is a summer trading, I decided to be cautious. It worked. But I’m writing this after I closed that trade, so this logic might be after-the-fact thoughts and I may have been just lucky. I don’t give myself a full-credit on what I write after things happen. Now I changed the view for EURUSD because 1. what I now label .1 is higher than previous .A, and 2. it broke the downward trend-line resistance, and even went higher than .1. So, the new analysis is that EURUSD has not finished b, and that peak near 1.4700 was sub-wave A (again, compare with the previous post). The new target for b is now 1.4800 level. So, I will wait for 2 around 1.4310 (? 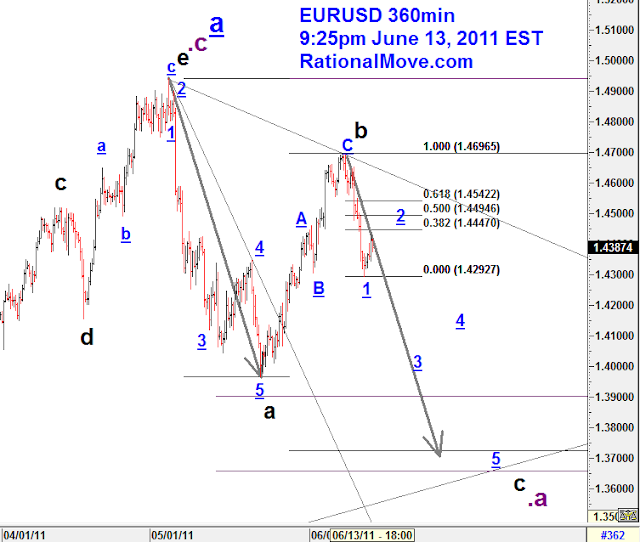 ), and buy EURUSD when it goes higher than 1. I will be cautious on this trade again. I won’t make a bit bet, and I will probably exit early. After I lost in the last trade of short EURUSD, I stayed back, and just observing the market for a while. 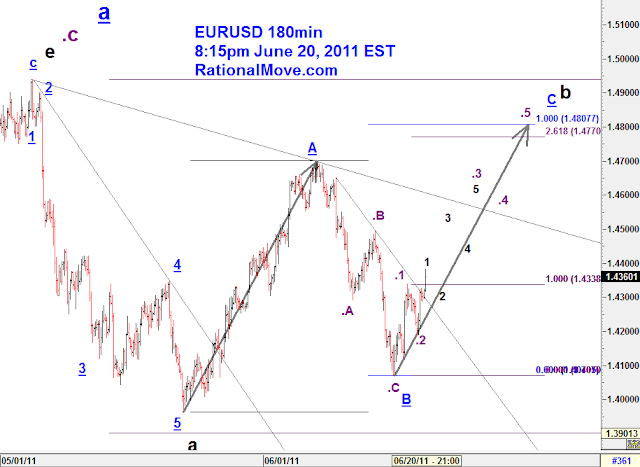 EURUSD surged to 1.47 level, and now mark this peak as the terminal of b wave. I’m currently waiting for 2, and I will carefully execute another attempt to profit by short EURUSD.